Four-fold repeat in plasma kallikrein and coagulation factor XI. Factor XI apple 3 mediates binding to platelets. Factor XI apple 1 binds high-molecular-mass kininogen. Apple 4 in factor XI mediates dimer formation and binds to factor XIIa. Mutations in apple 4 cause factor XI deficiency, an inherited bleeding disorder. 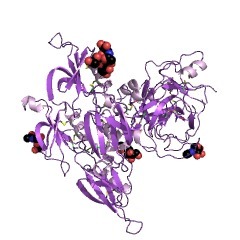 Plasma kallikrein (EC 3.4.21.34) and coagulation factor XI (EC 3.4.21.27) are two related plasma serine proteases activated by factor XIIA and which share the same domain topology: an N-terminal region that contains four tandem repeats of about 90 amino acids and a C-terminal catalytic domain. The 90 amino-acid repeated domain contains 6 conserved cysteines. It has been shown [(PUBMED:1998666)] that three disulphide bonds link the first and sixth, second and fifth, and third and fourth cysteines. The domain can be drawn in the shape of an apple (see below) and has been accordingly called the 'apple domain'. x       Cx x  x       x       apple domain. Apart from the cysteines, there are a number of other conserved positions in the apple domain. The apple domains of plasma prekallikrein are known to mediate its binding to high molecular weight kininogen [(PUBMED:8662705)], the apple domains of factor XI bind to factor XIIa, platelets, kininogen, factor IX and heparin [(PUBMED:9632702)]. There are 3067 APPLE domains in 698 proteins in SMART's nrdb database. Taxonomic distribution of proteins containing APPLE domain. This tree includes only several representative species. The complete taxonomic breakdown of all proteins with APPLE domain is also avaliable. Click on the protein counts, or double click on taxonomic names to display all proteins containing APPLE domain in the selected taxonomic class. The PAN module: the N-terminal domains of plasminogen and hepatocyte growth factor are homologous with the apple domains of the prekallikrein family and with a novel domain found in numerous nematode proteins. Based on homology search and structure prediction methods we show that (1) the N-terminal N domains of members of the plasminogen/hepatocyte growth factor family, (2) the apple domains of the plasma prekallikrein/coagulation factor XI family, and (3) domains of various nematode proteins belong to the same module superfamily, hereafter referred to as the PAN module. The patterns of conserved residues correspond to secondary structural elements of the known three-dimensional structure of hepatocyte growth factor N domain, therefore we predict a similar fold for all members of this superfamily. Based on available functional informations on apple domains and N domains, it is clear that PAN modules have significant functional versatility, they fulfill diverse biological functions by mediating protein-protein or protein-carbohydrate interactions. Identification and characterization of a binding site for platelets in the Apple 3 domain of coagulation factor XI. Activated platelets expose a specific, reversible high affinity (Kdapp congruent to 10 nM) binding site (n congruent to 1500 sites/platelet) for factor XI that requires the presence of high molecular weight kininogen (HK) and ZnCl2 (Greengard, J. S., Heeb, M. J., Ersdal, E., Walsh, P. N., and Griffin, J. H. (1986) Biochemistry 25, 3884-3890). Synthetic, conformationally constrained peptides from four tandem repeat (Apple) domains were tested for their capacity to inhibit 125I-factor XI binding to platelets. A peptide from the Apple 3 (A3) domain (Asn235-Arg266) inhibits factor XI binding to platelets in the presence of HK (42 nM), CaCl2 (2 mM), and ZnCl2 (25 microM), with a Ki congruent to 10 nM which is identical to the Kd for factor XI binding to platelets. A peptide from the A1 domain (Phe56-Ser86) partially inhibits factor XI binding to platelets (Ki congruent to 6 microM) by inhibiting factor XI binding to HK, whereas peptides from the A2 and A4 domains have no effect. 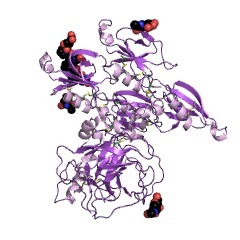 Using computer modeling for rational design, conformationally constrained peptides were synthesized (Pro229-Gln233, Thr241-Leu246, and Ser248-Ser261) each of which acted alone and synergistically when added together to inhibit factor XI binding to platelets. Finally, the 125I-labeled A3 domain peptide (Asn235-Arg266) was found to bind to thrombin-activated platelets in a specific, reversible, and saturable manner. 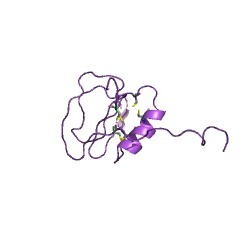 Thus, the sequence of amino acids Asn235-Arg266 of the A3 domain of factor XI comprises a contact surface for interaction with a platelet receptor. Identification and characterization of a binding site for factor XIIa in the Apple 4 domain of coagulation factor XI. Previously we have characterized a binding site for high M(r) kininogen in the first of four tandem-repeat (Apple) domains within the heavy chain region of factor XI (Baglia, F. A., Jameson, B. A., and Walsh, P. N. (1990) J. Biol. Chem. 265, 4149-4154; Baglia, F. A., Jameson, B. A., and Walsh, P. N. (1991) J. Biol. Chem. 267, 4247-4252), whereas a substrate binding site for factor IX was localized to the second Apple (A2) domain (Baglia, F. A., Jameson, B. A., and Walsh, P. N. (1991) J. Biol. Chem. 266, 24190-24197). To define the factor XI domain that binds factor XIIa, we have screened a panel of synthetic peptides for their capacity to inhibit factor XI activation by factor XIIa. 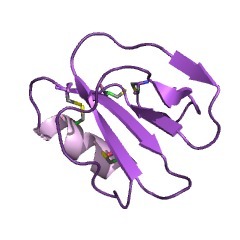 Peptide Gly326-Lys357 (located in the A4 domain) is a noncompetitive inhibitor of factor XI activation by factor XIIa (Ki = 3.75 microM), whereas structurally similar peptides from the A1, A2, and A3 domains were required at > 1000-fold higher concentrations for similar effects. The same peptide (Gly326-Lys357) is a competitive inhibitor of factor XIIa amidolytic activity (Ki = 3.8 microM) suggesting that it binds near the active site of factor XIIa. 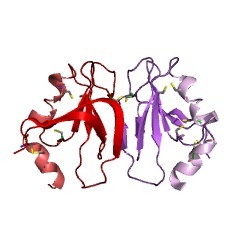 Computer modeling was used to predict the secondary and tertiary structure of the A4 domain of factor XI that interacts with factor XIIa. Rationally designed, conformationally constrained peptides were synthesized comprising residues Ala317-Gly326, Lys331-Lys340, and Gly344-Gly350, which act in concert to inhibit factor XI-activation by factor XIIa. Finally, a conformationally constrained peptide spanning residues Ala317-Gly350 inhibits factor XIIa-catalyzed factor XI activation 50% at a concentration of 5 x 10(-7) M. These results, interpreted in the context of the model, suggest that the sequence of amino acids from Ala317 through Gly350 of the heavy chain of the A4 domain of factor XI contains three peptide structures, possibly consisting of three antiparallel beta-strands that together comprise a contact surface for interacting with factor XIIa. Apple four in human blood coagulation factor XI mediates dimer formation. 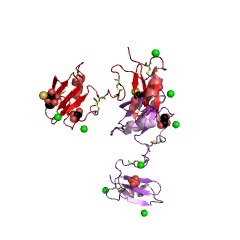 Human blood coagulation factor XI is a dimer composed of two identical subunits. Each subunit contains four apple domains as tandem repeats followed by a serine protease region. A disulfide bridge between Cys321 of each fourth apple domain links the subunits together. The role of Cys321 in the dimerization of factor XI was examined by mutagenesis followed by expression of its cDNA in baby hamster kidney cells. The recombinant proteins were then purified from the tissue culture medium and shown to have full biological activity. Normal recombinant factor XI was secreted as a dimer as determined by SDS-PAGE, while recombinant factor XI-Cys321 Ser migrated as a monomer under these conditions. Gel filtration studies, however, revealed that each protein existed as a dimer under native conditions, indicating that the disulfide bond between Cys321 of each factor XI monomer was not necessary for dimer formation. The fourth apple domain (apple4) of factor XI was then introduced into tissue plasminogen activator (tPA) to investigate its role in the dimerization of other polypeptide chains. The fusion protein, containing apple4 (apple4-tPA), formed dimers as detected by SDS-PAGE and gel filtration. Furthermore, dimerization was specific to apple4, while apple3 had no effect on dimerization. These data further indicated that the apple4 domain of factor XI mediates dimerization of the two subunits and the interchain disulfide bond involving Cys321 was not essential for dimer formation. Location of the disulfide bonds in human plasma prekallikrein: the presence of four novel apple domains in the amino-terminal portion of the molecule. 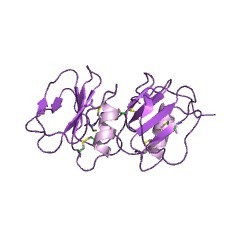 The location of 16 of the 18 disulfide bonds in human plasma prekallikrein was determined by amino acid sequence analysis of cystinyl peptides produced by chemical and enzymatic digestions. A unique structure, named the apple domain, was established for each of the four tandem repeats in the amino-terminal portion of the molecule. The apple domains (90 or 91 amino acids) contain 3 highly conserved disulfide bonds linking the first and sixth, second and fifth, and third and fourth half-cystine residues present in each repeat. The fourth tandem repeat contains an extra disulfide bond that forms a second small loop within the apple domain. The carboxyl-terminal portion of plasma prekallikrein containing the catalytic region of the molecule was found to have disulfide bonds located in positions similar to those of other serine proteases. Amino acid sequence of human factor XI, a blood coagulation factor with four tandem repeats that are highly homologous with plasma prekallikrein. A lambda gtll cDNA library prepared from human liver poly(A) RNA has been screened with affinity-purified antibody to human factor XI, a blood coagulation factor composed of two identical polypeptide chains linked by a disulfide bond(s). A cDNA insert coding for factor XI was isolated and shown to contain 2097 nucleotides, including 54 nucleotides coding for a leader peptide of 18 amino acids and 1821 nucleotides coding for 607 amino acids that are present in each of the 2 chains of the mature protein. 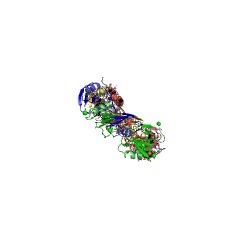 The cDNA for factor XI also contained a stop codon (TGA), a potential polyadenylation or processing sequence (AACAAA), and a poly(A) tail at the 3' end. 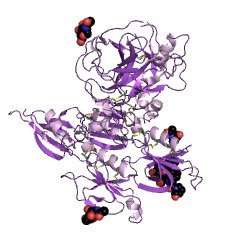 Five potential N-glycosylation sites were found in each of the two chains of factor XI. 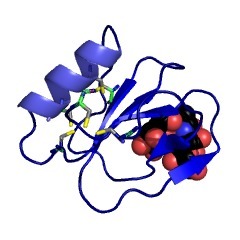 The cleavage site for the activation of factor XI by factor XIIa was identified as an internal peptide bond between Arg-369 and Ile-370 in each polypeptide chain. This was based upon the amino acid sequence predicted by the cDNA and the amino acid sequence previously reported for the amino-terminal portion of the light chain of factor XI. Each heavy chain of factor XIa (369 amino acids) was found to contain 4 tandem repeats of 90 (or 91) amino acids plus a short connecting peptide. Each repeat probably forms a separate domain containing three internal disulfide bonds. 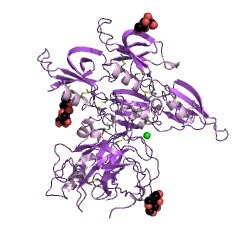 The light chains of factor XIa (each 238 amino acids) contain the catalytic portion of the enzyme with sequences that are typical of the trypsin family of serine proteases. 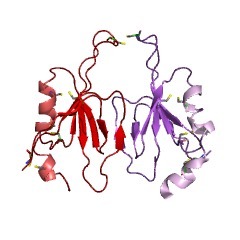 The amino acid sequence of factor XI shows 58% identity with human plasma prekallikrein. SwissProt sequences and OMIM curated human diseases associated with missense mutations within the APPLE domain. This information is based on mapping of SMART genomic protein database to KEGG orthologous groups. Percentage points are related to the number of proteins with APPLE domain which could be assigned to a KEGG orthologous group, and not all proteins containing APPLE domain. Please note that proteins can be included in multiple pathways, ie. the numbers above will not always add up to 100%. 2yio Crystal Structure of Parasite Sarcocystis muris Microneme Protein SML- 2 in complex with 1-Thio-beta-D-Galactose (SPACEGROUP C2221).